Death*: John died on 21 March 1904 at 1338 W. 49th Place, Chicago, Cook County, Illinois, USA, at age 72. Thomas-John, husband of the late Bridget Thomas. Funeral Wednesday from 1888 W 40th place at 10am to St. Rose of Lima church, thence by cars to Mount Olivet. [S621] 1900 US Census, Illinois, Cook County, Chicago, Washington, DC, ED 160; Sheet 5A; Ward 6, Ancestry.com; accessed March 4, 2006. [S242] Death Index to Deaths in Chicago, 1871-1933. [S177] John Thompson "Thomas", Death Certificate. [S2477] Dan Moore, "John Thomas and Bridget," e-mail to Elaine Beaudoin, March 18, 2017, Research done by Newberry Library and sent to Dan Moore. Death*: He died on 14 June 1999 at Bradenton, Manatee County, Florida, USA, at age 73; He was born July 28, 1925, in Chicago and came to Manatee County 14 years ago from Mount Prospect, Ill. He was a life member of Elks Lodge 1511 of Bradenton, American Legion Kirby Stewart Post 24 and Saint Norbert College Alumni Association of De Pere, Wis. He was a Marine Corps veteran of World War II and attended Saints Peter and Paul the Apostles Catholic Church. Survivors include his wife, Carole; two daughters, Patricia Kerner of Hudson, Wis., and Mary of Buffalo Grove, Ill; a son, Michael of Carol Stream, Ill; a sister, Dolores Lauer of East Chicago, Ind; and seven grandchildren. Visitation will be from 6 to 8 p.m. Wednesday at Brown and Sons Funeral Home, 43rd Street Chapel. A funeral Mass will be at 10 a.m. Thursday at Saints Peter and Paul the Apostles Catholic Church. Burial will be in All Saints Cemetery in Des Plaines, Ill.
Memorial donations may be made to Bradenton Hospice House, c/o Hospice of Southwest Florida, 5955 Rand Blvd., Sarasota, FL 34238; or to James Thomas Memorial Scholarship Fund, c/o Saint Norbert College, De Pere, WI 54115. Visitation for John A. "Jack" Thomas, 73, of Bradenton, Fla., will be from 4 to 8 p.m. Friday, at Matz Funeral Home, 410 E. Rand Rd., Mount Prospect. Born, July 28, 1925, in Chicago, he died Monday June 14, 1999, in Bradenton. Interment will be private. Mr. Thomas was a member of the St. Norbert College Alumni Association and a Marine Corps veteran of World War II in the 3rd Marine Division. He was the beloved husband of Carole J. Thomas of Bradenton; dear father of Michael J. (Donna) Thomas of Wheaton, Patricia Ann (Urban) Kerner of Hudson, Wis., Mary Thomas of Buffalo Grove and the late James P. Thomas; dearest brother of Dolores Lauer of East chicago, Ind; and loving grandfather of seven. Memorial made to the James P. Thomas Scholarship Fund, c/o St. Norbert College, DePere, Wis., or Bradenton Hospice House, 3355 26th St., Bradenton, FL 34205, are appreciated. [S819] Chicago Tribune, July 6, 1966, page A13. [S2181] U. S. Social Security Applications and Claims Index, 1936-2007, online www.ancestry.com, John Albert Thomas entry, accessed Ancestry.com January 15, 2016. [S1002] U. S. Social Security Administration, John A. Thomas, accessed June 16, 2010. [S1206] Sarasota Herald-Tribune, June 15, 1999, page 4B, GenealogyBank.com, accessed June 16, 2010. [S821] 1930 US Census, Illinois, Cook County, Chicago, Washington, DC, ED 369, page 234, Ancestry.com, accessed December 29, 2007. [S2272] Daily Herald, June 16, 1999, Section A, page 10, Accessed on NewspaperArchive.com, January 14, 2016. [S1699] Cook County Clerk Genealogy Records entry, Cook County birth registration, Albert Thomas entry, file number 6035112, accessed January 15, 2016 (2008). [S2271] The Daily Herald, April 6, 1981, Section 1, page 7, Accessed online at NewspaperArchives, January 14, 2016. Death*: He died on 4 July 1966 at St. Francis Hospital, Blue Island, Cook County, Illinois, USA, at age 71; St. Francis Hospital located at 12935 S. Gregory Street. John Thomas - Mass for John (Jack) Thomas, 71, 14325 Michigan av., Riverdale, who died Monday in St. Francis hospital, Blue Island, will be said at 10 a.m. tomorrow in Queen of Apostles Catholic church, Riverdale. He was a retired plant manager for the Texaco corporation with 43 years of service. Surviving are his widow, Lillian; a son, John A., and a daughter, Mrs. Dolores Lauer. Chicago Tribune, July 6, 1966, page A13. [S874] Chicago Tribune Historical Archive, July 6, 1966, Record # 19660706dn204, Accessed March 7, 2006. [S558] Chicago Tribune, June 16, 1939, Record Number: 19390616dn050; Chicago Tribune Historical Archive. [S2401] St. Rose of Lima Church, Chicago, Illinois, Baptismal Record, John Thomas baptismal record: Copy of record provided by Daniel Moore, November 24, 2016., October 3, 1894, www.FamilySearch.org. [S820] "John Thomas WWI Draft Regristraion Card", Ancestry.com, accessed December 29, 2007. [S309] US Social Security Death Index, 1935-Current, Ancestry.com, John Thomas entry, accessed December 29, 2007. [S622] 1900 US Census, Illinois, Cook County, Chicago, Washington, DC, ED 884, Sheet 2A, Ward 29, Newberry Library, accessed October 21, 2001. [S626] 1910 US Census, Illinois, Cook County, Chicago, Washington, DC, ED 1545, Page 36B, Ward 29, Ancestry.com; accessed March 5, 2006. [S625] January 7, 1920 US Census, Illinois, Cook County, Chicago, Washington, DC, ED 1792, sheet 8B, Ward 29, Ancestry.com; accessed March 5, 2006. [S821] 1930 US Census, Illinois, Cook County, Chicago, Washington, DC, ED 369, page 234. 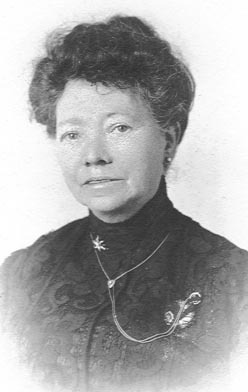 [S599] Bridget Kennedy Thomas, Illinois coroner's certificate of death, Family History Library, MF#1953487. [S1968] Baptism register, 1855-1876, page 50, Elizabeth Thomas baptismal record: FamilySearch.org accessed December 23, 2014; document provided by Dan Moore., June 20, 1869, St. James Church. [S187] William Edward Francis Vallely, Illinois Certificate of Birth no. 105050 (January 2, 1942, delayed filing). [S259] Lillian Thomas Vallely Davis, Illinois Death Certificate. [S627] Illinois Statewide Marriage Index 1763-1900, online www.cyberdriveillinois.com/GenealogyMWeb/marrsrch.html, Vallely, John L. and Thompson, Lillie F. Marriage License No. 00109631; accessed December 28, 2007. [S837] Vallely-Thompson Marriage License: FHL #1030160, Salt Lake City, Utah. [S627] Illinois Statewide Marriage Index 1763-1900, online www.cyberdriveillinois.com/GenealogyMWeb/marrsrch.html, Vallely, John L. and Thompson, Lillie F. Marriage License No. 00109631. [S943] Davis-Thomas marriage license: FamilySearch collection: Illinois, Cook County Marriages, 1871-1920, http://pilot.familysearch.org, accessed July 17, 2009. [S621] 1900 US Census, Illinois, Cook County, Chicago, Washington, DC, ED 160; Sheet 5A; Ward 6, Ancestry.com. [S620] 1920 US Census, Illinois, Cook County, Chicago, unknown repository address, ED 1792, sheet 8A, Ward 29, Ancestry.com; accessed March 4, 2006. [S264] Chicago Daily News, Monday, July 23, 1938. [S179] 1870 US Census, Illinois, Cook County, Chicago, Washington, DC, Ward 6; Page 142, line 17, Ancestry.com, accessed March 3, 2006. Hallaran - Ellen (nee Thomas) wife of the late Charles Hallaran, mother of Mrs. Berr (sic Burr), Mrs. Parent, Mrs. Hannah (sic Hanton?) and John Hallaran. Funeral Friday at 9 a.m. from late residence 375 29th St. to St. James Church, where high mass will be celebrated, thence by cars to Mount Olivet, 49th and Halsted Sts depot. 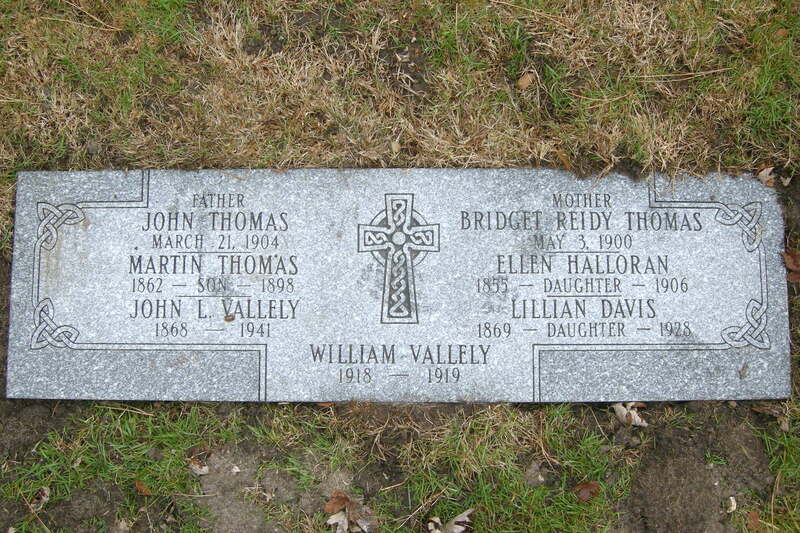 Name Variation: As of 12 January 1906, Mary Ellen Thomas was also known as Halloran The spelling of Halloran is used on her grave card at Mt. Olivet Cemetery. [S2056] Rootsireland.ie, online www.rootsireland.ie, Helen Thomas baptismal record, Parteen Parish, County Clare, accessed by Daniel Moore, April 11, 2015. [S268] 1900 US Census, Illinois, Cook County, Chicago, Washington, DC, ED 135, page 7A, Ancestry.com, accessed August 19, 2016. [S830] Ellen Hallaran, death certificate, FHL #1239736. [S838] Hallaran-Thompson Marriage License: FHL #1030101, Salt Lake City, Utah. [S627] Illinois Statewide Marriage Index 1763-1900, online www.cyberdriveillinois.com/GenealogyMWeb/marrsrch.html, Charles O. Holleren and Ellen Thompson, Cert. #31910; accessed December 28, 2007. [S827] Baptisms 1877-1889, page 126, Charles Hallaran baptismal record: FHL# 1752990, Item 6, November 7, 1886, St. James Church. [S2255] 1900 US Census, Illinois, Cook County, Chicago, Washington, DC, Ward 5, Precinct 28, sheet 7A, FamilySearch.org, accessed November 1, 2015. [S830] Ellen Hallaran, death certificate, Micropublications #1239736, Family History Library, Salt Lake City, Utah. [S232] Chicago, Illinois, Chicago Index to Deaths 1871-1933; FHL MF#1295975. [S265] Chicago Daily News, January 11, 1906. [S2531] Baptism Register 1895-1899, pge 65, Michael Patrick Thomas baptism record: Baptism register image provided by Dan Moore, September 14, 2017. Image accessed on FamilySearch.org., July 19, 1896, St. Rose of Lima Parish. [S2537] Michael Thomas, Illinois Report of Death, Viewed September 22, 2017, Family History Centery, Wilmette, Illinois. Film number 001033058. [S2103] Illinois, Cook County Deaths, 1878-1994, online www.familysearch.org, Michael Thomas, died 23 July 1898; FHL MF# 1033058; digital folder #4004320; image # 01434. Accessed September 14, 2017. [S2170] National Library of Ireland - Baptismal Registers, online http://registers.nli.ie/, Patrick Thomas entry no. 9328; page 294; microfilm no. 02413/02; St. Mary's Church, Limerick City, County Limerick, Ireland; Baptisms, 1837-1862. Accessed online July 10, 2015. Death*: He died before 8 January 1973 at Lake Villa, Lake County, Illinois, USA. Raymond [Pat] Thomas, suddenly, of Lake Villa, Ill., formerly of Gage Park, beloved husband of Bernice [Bea]; dearest father of James [Virginia]; dear grandfather of Carol [James] Corr, Barbara [David] Marran and James Michael Thomas; great-grandfather of Kimberly and Jennifer Corr and Jody Marran; fond brother of the late John [Lillian]; fond brother in law of Charlotte Drozky, the late Julia Cappetta and the late John Sukey; uncle of many. Please omit flowers. Funeral services Wednesday, 10:15 a.m. from Kenny Brothers Funeral Home, 3600 W. 95th St., to St. Clare of Montefalco Church, Mass 11 a.m. Interment St. Mary's Cemetery. 425-4500. [S309] US Social Security Death Index, 1935-Current, Ancestry.com, Raymond Thomas entry, Ancestry.com, accessed December 29, 2007. [S822] "Patrick Raymond Thomas WWI Draft Registration Card", Ancestry.com, accessed December 29, 2007. [S2403] St. Rose of Lima baptismal register, Patrick Thomas Baptismal Record: Record provided by Dan Moore, November 27, 2016, June 25, 1899, St. Rose of Lima Parish. [S822] "Patrick Raymond Thomas WWI Draft Registration Card", Family Search, accessed October 30, 2014. [S557] 1930 US Census, Illinois, Cook County, Chicago, Washington, DC, ED 558, Page 14A, Ward 15, Raymond Thomas noted as a second head of household. Ancestry.com, accessed December 29, 2007. [S1422] Cook County, Illinois Marriage Indexes, 1914-1942, online www.ancestry.com, Patrick Thomas and Bertha M(J)ucius, serial no. 0899146, May 7, 1921. [S1983] 1940 US Census, Illinois, Cook County, Chicago, Washington, DC, ED 103-1018; Sheet 62A, Ancestry.com, accessed February 5, 2015. [S1334] Chicago Tribune, January 8, 1973, page E11, ProQuest Historical Newspapers Chicago Tribune, accessed February, 2011. [S1180] Raymond P. Thomas Cemetery record, St. Mary Cemetery, Evergreen Park, Illinois. Death*: Bridget died on 31 December 1935 at Chicago, Cook, Illinois, USA, at age 83. Madigan, Bessie Thomas Death Notice. Chicago Daily News, January 2, 1936, page 32. E: What are the first memories you have of your grandmother, Bessie? H: She was always with us and she was a little lady and she was always smiling, and a lot of fun. Nellie went over to see her all the time and she would come and see us. E: Did she come visit you when you were little? E: Who lived with her? E: What did you call your grandmother? E: What were her other houses like? E: Is this why you don’t drink beer now? E: What was her house like? H: Her house was always clean and it was a normal house. I remember on Quincy she had a great big picture that Uncle George Rooney drew. It was black and white and I think it was a lion in a cage. It was really good. And, I always used to look at it. Uncle George drew on the side. He worked for the railroad. I don’t remember anything else special about the house. E: Do you remember the holidays with her? H: We always went over to her house for Thanksgiving dinner. She got sick and then Aunt Mae and Nellie took it over. E: Who came to Thanksgiving dinner at Nana’s? H: Aunt Mae and I think Burdett, Nellie, Pops, Tom and me; Uncle Harry and Uncle John. Aunt Nanny was living in Denver at the time, but Ruth would come sometimes. E: Her nephew, William Hallaran, used to live with her. Do you remember him? H: That was a long time ago. Yes, but I think I only met him once or twice. I forget why he was there. E: Thanksgiving was her holiday? H: Yes, She always had it until she fell down and broke her leg. She must have been in her 70s, she was running down the stairs to fix the furnace and she tripped on the stairs and broke her leg. She had to use a cane and never was quite the same after that. She couldn’t do anything around the house; she would sit in the chair. Nellie and Aunt Mae would come over to help her. E: Thanksgiving, was there anything special she made? H: I can’t remember, she was a good cook, good desserts, everything was good. H: I think once she went with us to Lakewood, Michigan. I think once we took her up there. We were right on the lake. We used to go for two weeks. She was just up there for a few days. She was in her 70s, I think. E: Did she ever talk about her husband? How did she support herself after he died? H: No, I don’t remember her talking about her husband. But, Nellie did. She would say how she was young and she had seven kids; he died of pneumonia I think. Nellie would say that she struggled along. I think she took in sewing (or washing and ironing) and she didn’t want to do that anymore so she opened a grocery store. Nellie said she did pretty good at that. E: Were you ever in the grocery store? H: I don’t even remember a grocery store. She probably got rid of it before I was born. I think her kids were all little when she had the grocery store. H: What I remember is running downstairs to see Nana and Uncle John when we were on Fillmore. Uncle John would be eating pig tails and he would wave them at me and scare me. He used to love them. I thought they were worms. I went into the kitchen and asked him if he was eating lunch and he said “Yes” and he shook it at me and it was a long thing. And I started screaming and ran upstairs and told Mother that Uncle John is downstairs eating worms. E: Do you know where Nana was born? H: No, I never knew. I never heard about where she lived. They talked about the Southside. She never talked about Ireland and she didn’t have a brogue. She never talked about Ireland. E: You thought she took in washing? H: I think Nellie told me that. Then it got to be too much for her. I don’t’ know why she opened a grocery store. She must have made some money because she bought two houses. E: I think two of her husband’s brothers had grocery stores. H: I didn’t know that. She might have bought one of their stores. E: I’ll have to see if I can figure that out. E: Do you remember any stories about Harry or John. We will talk about them again later. H: I remember Harry owned a tavern and I think Uncle John was a plumber. Harry asked John if he wanted to be a bartender for him. So John went to work for him. He [Harry] had a place at Madison and Crawford. And he and Uncle John didn’t get along; because he thought John was too friendly with the customers and talked too much. Uncle Harry was more of a business man. He had a woman who was a bartender and Uncle Harry thought she was wonderful. My Uncle John didn’t like her because she was giving free drinks to the customers. Uncle John told Uncle Harry this and Harry didn’t believe him and they had a big fight over it and he fired Uncle John. E: Was this Harry’s first bar? E: Do you remember Nana after she got ill? H: I just remember when we went to visit her she would be sitting in her chair. I was about 16. She didn’t have her pep anymore. I don’t know if she got the flu or something and she went to bed and was there for two weeks or so and then she died. H: I think they still lived there. Uncle Harry got married late. I can’t remember. Uncle John went to Wisconsin, Hayward I think. I guess they stayed at Nana’s house until they got married. Uncle Harry married Margaret Saunders and they lived around Garfield Park someplace. I think that is when he gave up the [tavern] business. E: You mentioned that Nana was waked at her house. H: All I remember is that I was sitting in the front room and she was by the window and Uncle John came in and he leaned over her and was crying. I remember watching him. That is all I remember about the wake. E: Were there other people there? H: I can’t remember, I suppose there were people that came. I remember Mary Sullivan [Helen’s cousin] came. She hadn’t seen me in a long time. She said, “Oh you really have grown up.” She was a few years younger than me. E: What was the funniest thing you remember about her? H: I really don’t remember anything funny about her. E: You know when your grandchildren and great grandchildren are asked that question about you they won’t be able to stop talking!! E: Do you remember anything sad about her. H: The only thing I felt sad about was when she fell and she broke her leg [3 or 4 years before she died] and she couldn’t do anything. She changed. She just sat there and waited for Nellie and Aunt Mae to come over to help her. Nellie went over there on Monday and Wednesday and Aunt Mae went Tuesday and Thursday. They washed and iron and clean the house and would go to the store. So finally Aunt Mae said “I’m tired of all of this baloney. Harry should get a maid.” So she told him to get a maid, and said “we are not coming over any more.” Nellie said she didn’t mind. Aunt Mae said “I do.” I think Harry got a maid and her name was Alma or something like that. E: I just realized that they were doing housework not just for Nana but for Harry and John also. E: Did Nellie and Nana go out together or go over to your house? H: Oh yes, lots of times she would come over to the house, especially when she was over at Congress. They talked on the phone and they were very friendly. We’d go see her. She was always around. They were real friendly. We’d see her at all the get togethers. E: Did they play cards or do other things together? H: I think they played cards, I can’t remember anything special. E: She [Nana] was twenty years younger than you are now. Did she seem old to you? H: She still seems old to me, she was a little grey haired old lady. She wasn’t silly like me. But she was very interested in everything and everybody. E: What else to you remember about her or her place? H: I can’t remember Congress at all. I remember Fillmore and Quincy. H: I think she is buried out in Evanston, at Calvary I think. E: Do you remember her funeral? H: Funny I can’t remember anything. I just remember sitting in her living room when she died. E: Probably at Resurrection Parish? H: Yes, probably at Resurrection because she lived just before Cicero Avenue. But I can’t remember anything about the funeral. E: Could you describe her physically? H: She was only about 5 foot two, maybe a little shorter then Nellie. She had grey hair when I knew her, but I think she had red hair when she was young. She wasn’t fat and not thin, just normal. She always wore her hair up in a knob on the top of her head. She was always neat and always trying to help people. E: Well, thank you very much for the interview. H: I hope it doesn’t sound too crazy. Uncle John, the youngest, was my favorite, full of fun and so nice. He worked for Uncle Harry at the tavern. [S2167] Baptismal Register, Bridget Thompson baptismal record: National Library of Ireland images, film 02413/02, page 238, accessed July 9, 2015, 06 Jan 1837 - 24 June 1862, St. Mary's Church. [S457] 1900 US Census, Illinois, Cook County, Chicago, Washington, DC, ED 220, sheet 1A, ward 9. [S322] 1910 Census, Soundex Card. [S324] James Madigan, Department of Health: City of Chicago Report of Death. [S941] Chicago City Directory, 1891, page 1507. [S283] Chicago, Chicago City Directory. [S623] 1920 US Census, Illinois, Cook County, Chicago, Washington, DC, ED 2283; Page 5A; Ward 35, Ancestry.com; accessed March 5, 2006. [S699] Chicago Daily News, January 2, 1936, Page 32. [S329] Interview,, Various dates Helen McIntyre personal knowledge, No documentation. [S871] Mayme Veronica Harbison, Illinois Medical Certificate of Death, Cook County Genealogy Online, www.cookcountygenealogy.com, August 14, 2008 download. [S461] Interview, Helen McIntyre, various dates, Interviewed by Elaine M. Beaudoin, March 7, 2006.